Dubai UAE, November 17, 2015: This year, diptyque has introduced three new candles to light up the holiday season: a limited edition collection dedicated to the olfactory attributes of trees. 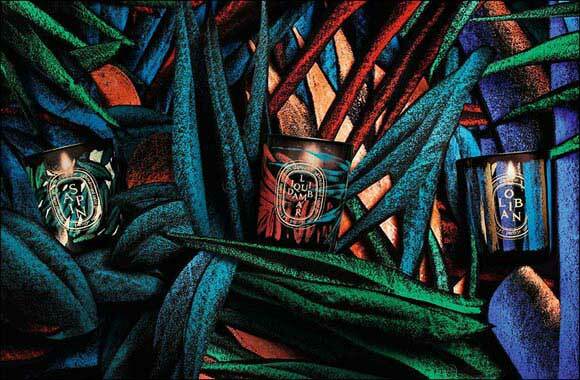 The Perfume House has invited Julien Colombier – a painter dedicated to mysterious forests and enchanted jungles – to accompany it on this new sensory adventure. He provides the flow, the light, the colours; diptyque provides the texture, the flavours, the fragrances; together they have developed three original and joyful ambiances. A common creative flame burns within the perfumer and the artist who have collaborated to produce a series of timeless ambiances which express their individual sensibilities. Bound together by this decorative approach to art, their two worlds collide through the senses. In these fascinating olfactory or visual “settings”, nature intervenes as a constant catalyst: diptyque draws upon the noblest of its raw materials; the artist draws upon the interplay of lines and shapes, using universal geometry as a basis for smooth or angular forms. the perfumer's imagination takes them towards liquidambar, a flamboyant foliage-inspired scent. Twilight blue merges with the edges of wood, which will soon welcome the precious pools of oliban resin. Golden spheres hang at the end of needle-covered branches and the scent of the fir tree is topped off with a hint of citrus peel. This collaboration is based on evocations free from naturalism and symbolism, relying on ongoing exchanges between the visual and the olfactory. These dreamy settings are illuminated by the flames of candles, spreading the mystery of the trees with enveloping, subtle and dense fragrances. A series of poetic contrasts reminiscent of the holiday season is available in three fragrances: Sapin (fir tree), Liquidambar and Oliban. The base of which draws back to childhood, to the beauty of winter and the memories of a Christmas gone by. The fragrant resin crystals are infused with a hint of mandarin: a familiar yet unprecedented meeting of citrus and woody notes. A celebration of nature’s delights, which embraces the redness of this large autumnal tree. Its enveloping liquid amber is spiced with nutmeg and cinnamon, then cloaked in the scent of brown sugar, providing a sweet and warm veil of gourmand accents. A thousand and one mysteries are released through the sweet oriental vapours of incense. The woody accents are set against fresh notes and balmy tones within this warm and soothing aromatic gem. ‘fascination’ lead him to discover Matisse, Keith Haring and other artists capable of painting the energy of joy. The young artist thus discovered the power of patterns. Repeated, rhythmic, expressed patterns and their perpetual rhythm. On a black background, armed with pastels and chalk, he hones a technique that occupies the space with a collision of colours, which he uses like a source of light. Jungles, clouds, waves and geometric figures become pretexts for these contrasts and reality becomes distorted, bordering on abstraction. For while he prefers that which is universal and timeless, his patterns are not subjects; rather, they serve as media for creating atmospheres free from personal narrative and projections. A single principle: first, make a clear and head-on impact; then, emphasize the resulting waves of emotion with finesse and nuance. ‘Tried and tested’ by the world of fashion and design, these collisions were soon to find new surfaces to colonise. Julien Colombier thus invades books, picture rails, fabric, walls and skateparks; he collaborates with large and prestigious fashion Houses, and his work is exhibited in Europe and the United States. And he especially likes to go from project to project, seeking a form of harmony in discordance.